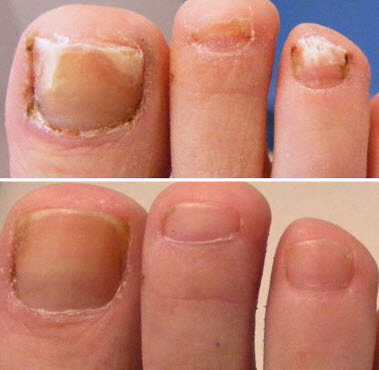 Millions of people suffer from nail fungus. Nail fungus infection is a condition which can be embarrassing and often, even painful. Fungal infected toenails are one of the leading reasons people visit podiatrists. Adults over the age of 60 or patients suffering from diabetes, patients with circulation problems or patients with a weakened immune system are more susceptible to nail fungus. Men also have a higher chance of developing nail fungus than women. Fortunately, there is a way to get rid of nail fungus with no harsh chemicals or toxic medications. The 1040 YAG Lasers are 80-90% effective at eliminating fungus from fingernails and toenails after just 3 treatments. This amazing treatment takes only twenty minutes, and results are visible as healthy nails grow in. There is no surgery required, no anesthetics required and no down time. Patients who can walk in can walk out right after treatment. The premium laser for toes and feet! This treatment, first available in Canada, is now available here in the United States! How does the laser work? The mechanism of action is thought to be a combination of photo-inactivation of the fungus cells and the raising of the temperature of the nail plate and nail bed with laser energy to the point of destruction of the nail cells. The penetration level of the laser is dependent on the wavelength of the machine and that is why we have selected a 1040nm machine for the office. The efficacy (described as clearing of nail) is estimated to be over 80%. Of course, in medicine, there are always exceptions and cases that stump all the experts.